We are proud to be the hemisphere's first reseller of Magnic Lights, the lightest and most efficient self-powered bicycle lighting system in the world. The newly-released IC version now includes standlight functionality, so you don't go dark at stops. A few years ago, a fellow named Dirk Strothmann and his kids were playing with some magnetic balls. They also had some extruded aluminum channels, which served as tracks for the rolling balls. They expected the smooth heavy magnets to roll very fast in a smooth non-ferrous track, but that's not what happened. Instead, the rolling magnets induced what are called Foucault, or eddy currents in the track, transiently magnetizing the aluminum, and causing the balls to roll strangely slow, as if through honey. This set him to thinking about bicycle lighting generators. Bicycle rims are most commonly made of aluminum. If the rims could be made to generate eddy currents while moving through a magnetic field, couldn't this be harnessed to produce a meaningful amount of light, improving greatly on the high-friction tire-roller types, or the more expensive and heavier hub types? Several people told Dirk, an engineer, that it was impossible. After all, there were already lighting products on the market that attached magnets to the wheels to produce only meager light. Surely there wouldn't be enough power without adding anything to the wheels. Surely? Dirk was undeterred, or perhaps encouraged, by the skeptics. 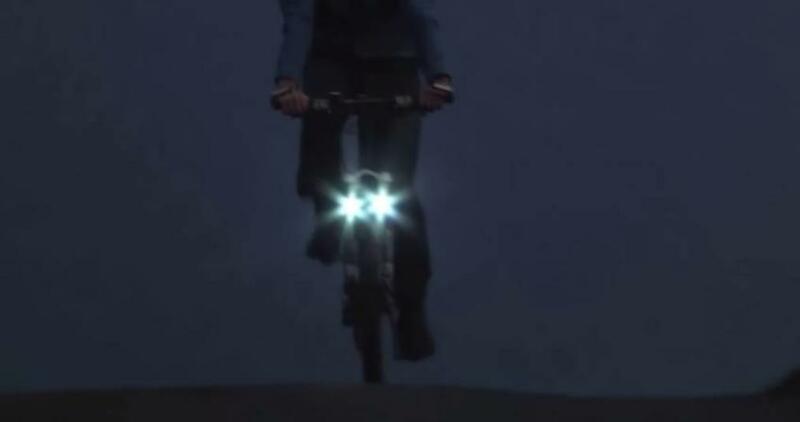 And soon, he had built prototypes of the world's lightest and most efficient bicycle dynamo lighting system. Completely self-contained, with no batteries or switches, Magnic lights don't even touch the wheel: they light up when held next to the moving rim, with what seems like zero resistance. And they are bright enough to be your only lights! Lightest and most efficient: especially important for, e.g. bikes that must be carried, or for endurance sport. Rando types: hard not to like Magnics. Depending on your bike's brakes, tires, frame structure, and certain components like racks, mounting can vary from simple and elegant to awkward to impossible without custom fabrication. Many cases require either hands-on consultation or a somewhat technical interview for us to supply you the right mounting parts. Current mounting options don't accommodate double panniers aft. Sold? Ride on over or order online.